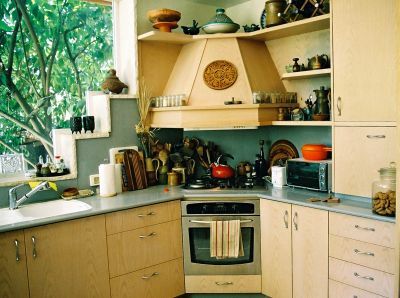 So you want to know about refinishing kitchen cabinets? This is one of the main tasks during a kitchen remodeling project. The first thing to do is remove all the grime to see what you've got to work with. Kitchens tend to have some grease in the air from cooking and it settles on the cabinets. This in turn attracts dirt and dust. Yes, this is true even if you attended a fancy cooking school! The first thing you need to do is remove the cabinet hardware. This includes pulls and hinges. Remove the drawers. Now, using rubber gloves, gently rub the cabinet surfaces with #000 steel wool. Repeat each spot as needed until all the grime is washed away. When you're done, you can see your cabinets finish and what youve got to work with. If you have a natural wood finish and you're satisfied with your degreased surfaces, you can proceed with a light sanding and applying a fresh coat of polyurethane and then replace the hardware. Keep in mind that you can stain your surfaces to a darker shade. I like to use Minwax. They make a very nice product that has the stain built right into the polyurethane. Apply two coats, going over it with #000 steel wool after the first coat dries. If you have any holes or imperfections, fill them with wood putty and let them dry. Use fine sandpaper to get a smooth surface. Dont forget, if you have any areas where the previous paint has chipped away, use sandpaper to feather the edges and then prime the bare wood. Now mask off all surfaces that the cabinets contact with painters masking tape. Spread drop cloths to prevent splatters on your countertops and flooring. Start by doing the cut-in painting where you have applied the painters masking tape and any other hard to get to areas. Once all the cut-in work is completed, turn your attention to the face frames. A short (4 or 6 inch) foam roller is a good choice for this part of painting your cabinets. Not having any nap will minimize lift and your finished paint job will be smoother. Next, you should begin on your cabinets doors and drawers. In many cases, it makes sense to order custom doors for an updated or enhanced look. Otherwise, the first thing you want to do is to paint the insides of the cabinet doors. While you give them time to dry, go ahead and paint the fronts of the drawers. Finally, paint the door fronts. Give the paint twice the time to dry that you think you need (otherwise the hinges and pulls will stick). Now its time to put your kitchen hardware back in operational order. Replace the hinges and attach the doors to the kitchen cabinets. Put new drawer liner paper in the drawers and re-install them. Install the drawer pulls or knobs, either the ones you initially removed or new ones that you purchased. There! Youre done. Prepare yourself a celebration meal and enjoy!